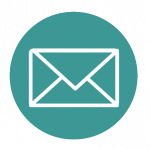 Although constantly improving, conventional cancer treatments (chemotherapy, radiotherapy, surgery) can sometimes be ineffective in treating certain cancers, especially those that are recurrent, are not diagnosed sufficiently early, are metastatic, or are very aggressive cancers, such as glioblastoma. Thus, a number of nanodrugs have been developed and tested in humans, leading to an improvement in therapeutic efficacy and/or a decrease in toxicity compared to non-nanometric drugs. In addition to the advantages linked to their size, another property of nanopharmaceuticals makes it possible to foresee new perspectives in medicine, especially in oncology: the possibility of activating these therapeutic substances on demand by exposing them to an external source of energy, such as a magnetic field. Current treatments such as chemotherapy and radiotherapy can be very toxic. Beyond problems related to the side effects of these treatments, it is sometimes impossible to use the doses of chemotherapy and radiation required to completely eradicate cancer in some patients. Thus, current treatments are sometimes unable to offer appropriate therapeutic efficacy in some cancer patients. With an on-demand activation of the drugs, it becomes possible to activate the treatment only when the therapeutic substance is in the tumor, to reactivate it as many times as necessary until destruction of the tumor has occurred, and therefore potentially to increase very substantially drug efficacy while reducing drug toxicity. Among the nanodrugs that can be activated by an external source of energy are different types of metallic nanoparticles, notably iron oxide nanoparticles, which have been used in humans as contrast agents and are known to be relatively non-toxic. Most of the time, these metallic nanoparticles are heated locally to induce antitumor activity. 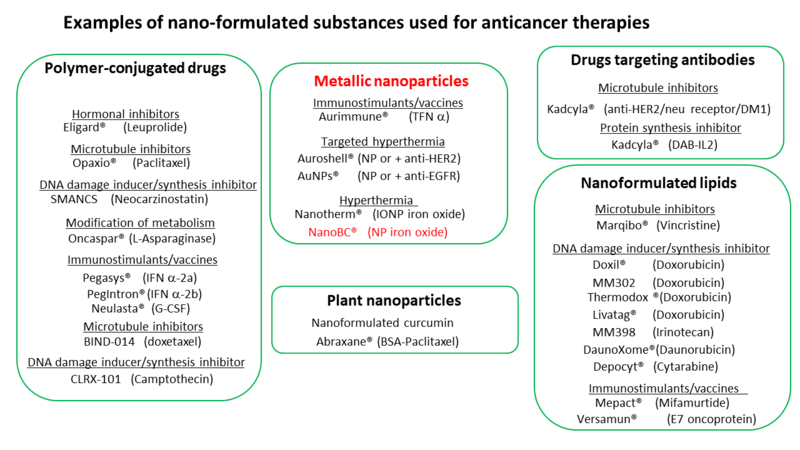 Numerous scientific publications describe antitumor results (often spectacular) obtained with these nanodrugs in murine models. However, very few of these therapeutic substances are available clinically, which can be attributed to the high cost of developing these treatments, and to a still poor understanding of the underlying mechanisms involved in the antitumor activity. This figure details nanodrugs under development or already on the market.